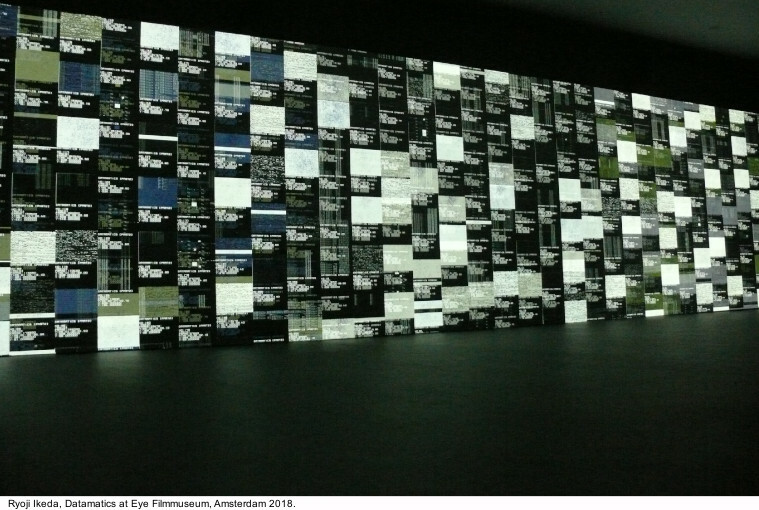 The exhibition Ryoji Ikeda, on show at Eye Filmmuseum, offers an insightful perspective on the radical work of Japanese audiovisual artist Ryoji Ikeda. 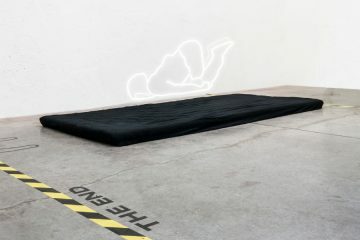 The selection ranges from sculptural pieces such as data.scan (2009) and grid.system (nº1-A) (2012) to newly adapted versions of large-scale projections like the radar [3 WUXGA version A] (2012-2018) and data.tron [3 SXGA + version] (2009-2018), and includes two new audiovisual installations made specially by Ikeda for Eye. Sound artist, electronic composer and visual artist Ryoji Ikeda (born in Gifu in 1966) started in electronic music and now ranks as one of the pioneering artists who approach the fundamental elements of sound and image in a mathematical, physical and aesthetic manner. 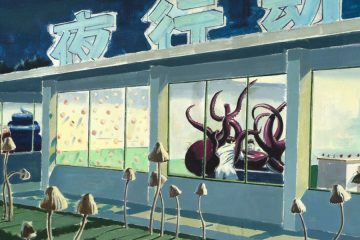 Ikeda’s career as an audiovisual artist transformed when he joined the multidisciplinary artist collective “dumb type” from Kyoto, which radically renewed theatre in the 1990s. By then, Ikeda had already defined the alphabet of his sonic language in the two fundamental elements of sound: the sine wave and white noise. Inspired by his experience with dumb type, Ikeda broadened his scope of work to encompass both sound and image. He applied a comparable reductionist approach in identifying the pixel as the elementary component of the image. In his series “datamatics”, featuring data.tron [3 SXGA + version] (2009-2018) and data.scan (2009), both on show in the exhibition, Ikeda investigates how we can perceive and experience vast flows of data that go beyond our comprehension. Each pixel is determined by strict mathematical rules that are applied to the data sets that form the source material. The resulting works are not so much about the abstract data level but about representations of reality that we can generate with data. 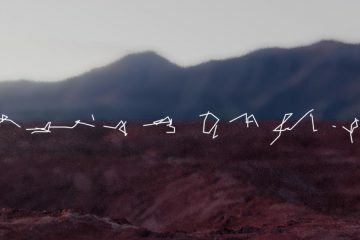 They are an ode to the scientific imagination and the enthralling exploration of uncharted worlds and aspects of reality that we can now access thanks to science. During his stay at CERN and Ars Electronica Futurelab in 2014-2015, Ikeda explored the world of particle physics and further refined his notion of (big) data. 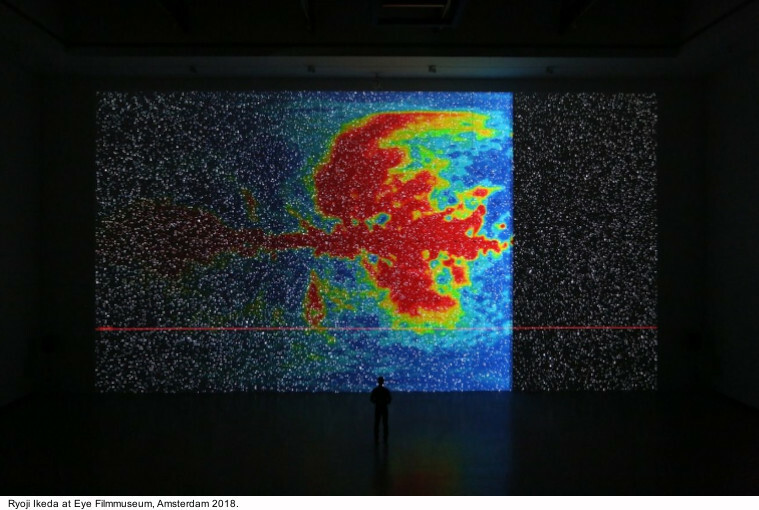 He examined dynamic data but defined his source material exclusively as static data: absolute facts, constant truths such as DNA code, galactic coordinates, or proteins, as in his spellbindingly immersive floor projection data.gram [n ° 1] (2018), which he developed specially for Eye. 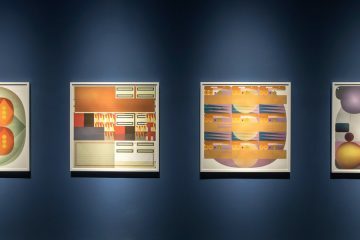 Here Ikeda also explores his interest in the micro-scale: identifying and isolating the smallest particle, the alphabet of all material. 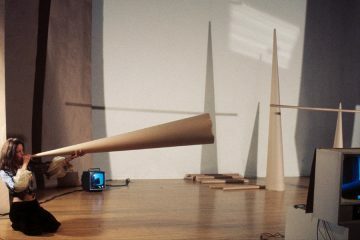 Also on show in the exhibition is 4’33” (2010), Ikeda’s celluloid homage to the iconic work of the American experimental composer John Cage. 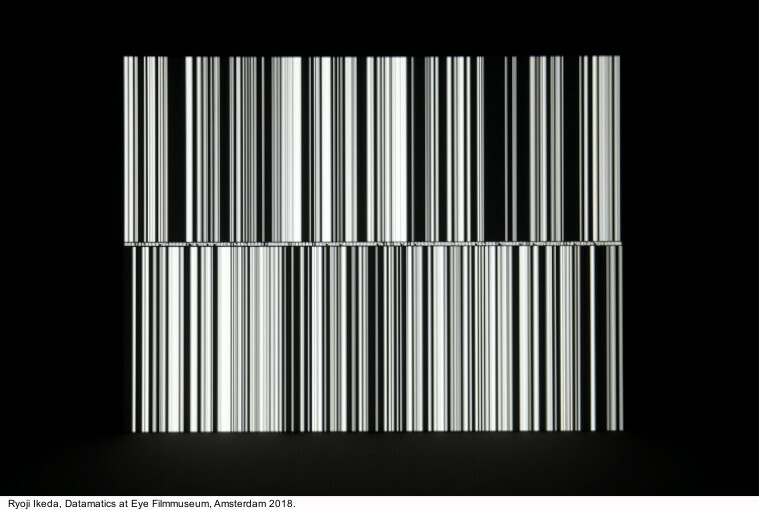 A framed and sliced strip of blank 16 mm film: the piece forms a conceptual introduction to Ikeda’s ongoing study of the contrast between the continuous and the discrete or discontinuous. In data.tron [3 SXGA + version], Ikeda explores his fascination for the concept of infinity and fundamental mathematical and philosophical questions. Is reality continuous or not? Is it continuous but can we do nothing but apply the modern scientific method of reducing it to elementary particles in order to understand it? The exhibition culminates with the second new piece specially made for the Eye exhibition: point of no return, which represents nothing but a black hole. A black circle is bordered by a clear white light. Shining from the other side is an extremely powerful lamp whose colour temperature approaches that of the sun on the projection screen. The exhibition is accompanied by films, talks and events in the cinemas at Eye. On November 23, Ryoji Ikeda will perform a live audiovisual concert at Eye entitled datamatics [version 2.0]. In collaboration with Amsterdam Art Weekend and IDFA.